The Immortals Overwatch team has an impressive damage-dealing duo in GrimReality and Agilities, but every now and then, it’s nice to see a couple of greats get cut down. The internet enjoyed schadenfreude at Immortals’ expense during yesterday’s Overwatch “Monthly Melee” semi-finals, where our two anti-heroes got way too cocky about sneaking out onto a ledge. You can check out the full match here. We’ll jump into third game in a best-of-three between Immortals and FaZe, The round starts out straightforward, with FaZe on the payload. Immortals struggles through their first push, partially due to FaZe’s Symmetra player, Forsaken, whose well-placed teleporter allows the team to keep close to the payload. After the teleporter runs out, though, the match gets tricky for FaZe, thanks to some incredible shooting by Immortals’ McCree player, GrimReality. Even as the rest of his team gets picked off, Grim holds his own, strafing around the courtyard like he’s on an ice-skating rink and taking out the FaZe players one by one. 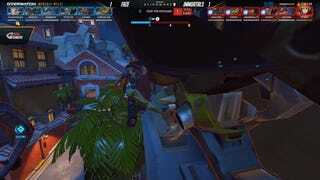 High on his shooting spree, which just propelled the round into overtime, GrimReality joins his fellow Immortals colleague Roadhog, played by Agilities. The duo heads out onto a ledge together, GrimReality in front and Agilities in back. The plan is to set up an ambush on the opposing team’s payload as it pushes down the alley. They pause for a moment, waiting for the enemy team to pull around the corner they’re facing… but instead, they get flanked themselves. From the balcony behind them, five FaZe players appear and set their sights. Specifically, FaZe’s Ana player, Rawkus, hits Agilities with a sleep dart and sets him up to get hooked right off the ledge; he dies instantly, in a very un-agile yet hilarious way. After these embarrassing experiences, and with only a minute left to go on the clock, you’d think that Immortals wouldn’t be able to turn the match around, but they do. Immortals’ D.Va player, Hyped, gets a surprising three-kill blast with his ultimate ability. Meanwhile, GrimReality respawns after his humbling experience and dashes back to join his teammates and get some kills before the clock runs out. Unfortunately, FaZe chokes at the end of this round in spite of having some ults of their own, and they would go on to choke at the tournament in general. FaZe ended up getting knocked back to the Loser’s Bracket after losing to Immortals, at which point they lost against the Hammers Esports team in the Loser’s Bracket. FaZe placed fifth in the tournament overall. Immortals went on to take third place, which earned them a $1,000 prize—and, probably, no lessons learned at all about standing on ledges. Even the pros get cocky sometimes, but GrimReality might want to watch his step out there.